With the spring finally upon us, Apple this morning is going about some spring cleaning of the iPad family. 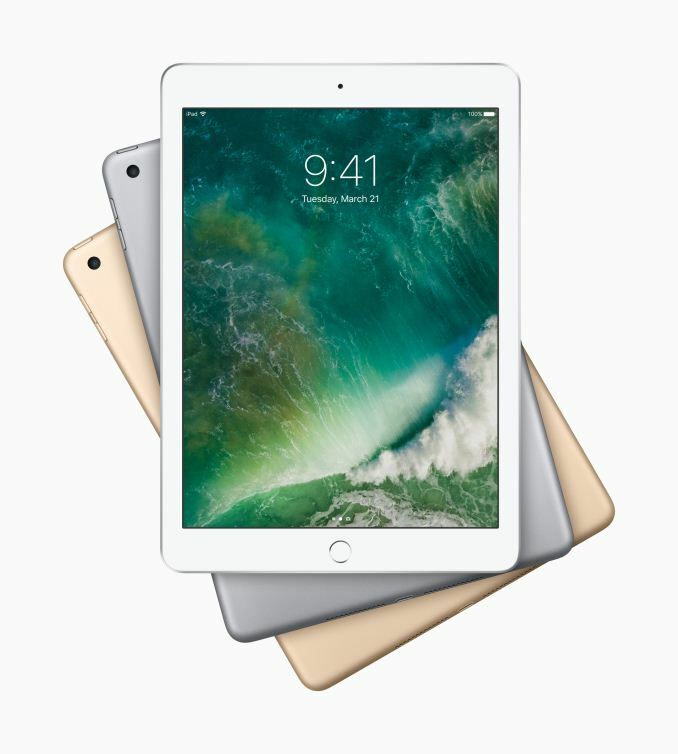 The iPad Air 2 and the iPad Mini 2 have been discontinued, making way for a new entry-level iPad: the simply named iPad 9.7-Inch. This latest iPad is a bit of an unusual twist on the usual Apple fare; it’s not really a successor to the iPad Air 2, and from a features perspective it’s essentially a kitbash of a few different Apple products. None the less, at $329 it’s also the lowest Apple has ever priced a 9.7” iPad, as retailer sales aside, Apple hasn’t offered this size below $399 before. As a result the new 9.7” iPad is likely to make an impact, even in the softening market for tablets. From a high-level perspective, the iPad 9.7” (2017) is an interesting kitbash between the iPhone 6s, the iPad Air 2, and the iPad Air 1. It’s obvious that Apple was aiming to make a more budget-friendly iPad from the start, so you won’t find any new, cutting edge technology in here. Rather everything is essentially cobbled together from the aforementioned Apple products. This, consequently, is also why the 2017 iPad is not a true successor to the iPad Air 2, as it makes some necessary compromises to hit the $329 price tag. 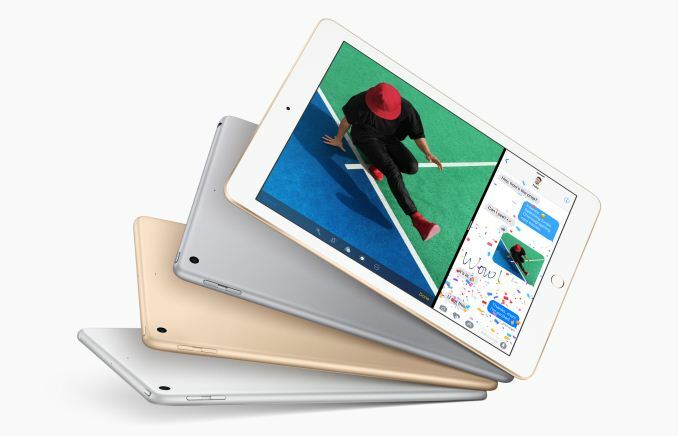 The shell itself is taken from the iPad Air 1, offering the same dimensions and weight as Apple’s 2013 flagship tablet. This means that at 7.5mm, the new iPad is actually thicker than the iPad Air 2 by 1.4mm (~23%), though as we’ll see, Apple appears to be putting some of the additional volume to good use. Apple also seems to have lifted the display assembly from the iPad Air 1; while all of the modern Retina 9.7” iPads have offered a 2048x1536 IPS display, this one in particular lacks the fully laminated display that was introduced in the iPad Air 2 and is part of the reason that the aforementioned tablet was made thinner. Meanwhile inside the tablet itself, Apple has lifted the bulk of the guts from the iPhone 6s. At the heart of the new iPad is an Apple A9 SoC, which incorporates a pair of Apple’s “Cyclone” CPU cores and a 6 cluster PowerVR Series7XT GPU. Based on Apple’s performance estimates, it looks like this is clocked at or very near the 1.85GHz clockspeed of the iPhone 6s, so burst performance should be very close to the iPhone’s. Meanwhile Apple hasn’t confirmed the memory capacity, but since the A9 is a PoP design (and all other 9.7” iPads have 2GB of RAM), 2GB is almost certain for the new iPad as well. Finally, from the iPad Air 2 comes the tablet’s camera modules. The rear camera is an 8 Megapixel f/2.4 camera that we’ve seen in the iPad Air 2 and a number of other Apple tablets, while the front camera is Apple’s similarly common 1.2MP f/2.2 camera. Apple doesn’t publish the exact sensor configuration, but I would be surprised if this wasn’t lifted wholesale from Apple’s existing camera module stockpile. Getting back to size for a moment, the 2017 iPad 9.7” will also have the highest capacity battery of a 9.7” iPad in the last few years. Along with the iPad Air 1 shell, Apple has also brought back that tablet’s 32.4 Watt-hour battery, giving it a 19% battery capacity boost over the iPad Air 2. Coupled with the use of a smartphone SoC, and I’m very curious to see what real-world battery life is at. While Apple officially advertises the iPad as having the same 10 hour (Wi-Fi) battery life as the other iPads, there’s definitely some room to pick up another hour or two of runtime. Though ultimately it’s going to be the display that’s the deciding factor, as it’s already the biggest power consumer on an iPad. Apple will be offering the 2017 iPad 9.7” in two capacities, 32GB and 128GB, with the latter capacity carrying a $100 premium. Somewhat surprisingly, the company is also offering a version of the tablet with a cellular modem despite the budget-focused nature of the tablet. Unfortunately Apple is still charging a $130 premium for this functionality, which feels especially steep given the tablet’s low base price. Finally, Apple will begin taking pre-orders for the tablet this Friday the 24th. The tablet is set to ship to next week to both pre-order customers and retail stores. Overall it will be interesting to see how Apple’s new entry-level iPad does in the market. The company’s tablet business continues to chug along, but sales as well off from their heyday as tablet replacement cycles are closer to laptops than phones. At the same time the iPad 2 was one of Apple’s most popular tablets due to its relatively low price for its size, so Apple may be looking to recapture some of that energy. Though it’s interesting to note that in this process, Apple has actually increased the price of an entry-level iPad some; whereas the discontinued iPad Mini 2 was $269, the new iPad bumps that up by $70. Speaking of which, the new iPad does put the remaining iPad Mini 4 configurations in a bit of an odd spot. The tiniest tablet actually did get an update of its own: the $399 32GB model was discontinued, and the sole 128GB model has been dropped to $399 in its place. Despite the price shuffle though, it is an older design and remains the only iPad not using an A9-generation processor. While Apple’s spring cleaning makes it clear which tablet Apple wants to be their entry-level iPad, the Mini remains as the odd man out in this new lineup.